Laminate floors require particular care when you’re mopping them. Mainly, keep the floor as dry as possible and stay away from using oily, waxy floor-care products, oil soaps and similar cleaners that may work well on other types of floors. A combination of dry and damp mopping maintains a laminate floor looking its best. Firstly, we need apply dry mopping on laminate flooring. Dry mopping removes everyday dirt from the floor, including pet hair, food particles and dust, as well as dirt tracked in from outdoors. A microfiber dust mop picks up lightweight debris without scratch the floor. 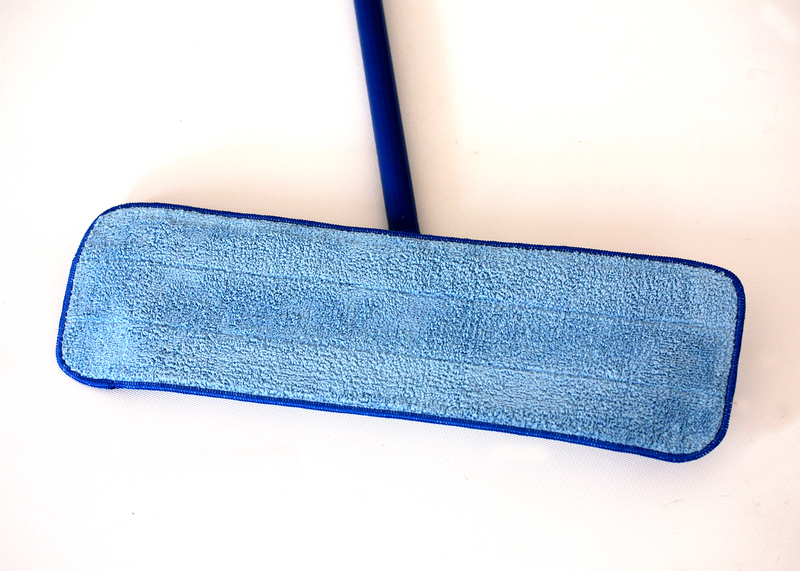 A dry mop designed to apply disposable static dust pads also works, although the microfiber variety lasts longer and may be washed. A soft-bristled broom may be used before or along with dry mopping to pick up pick up large debris such as tiny rocks or food bits before dry mopping, as these larger, bulkier items may not stick to the mop head. 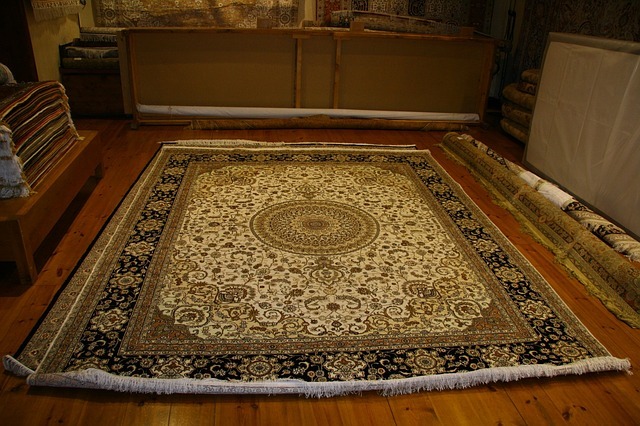 Before dry mopping, take out the floor mats and rugs and shake those items outside the house. Then dry mop the whole floor, overlapping strokes slightly as you mop to ensure you cover the whole floor area. Check the mop head or static pad from time to time to see if it is full of debris such as hair and dust. In that case, deposit the debris in the trash, shake the microfiber mop head outdoors, or replace the static pad if you’re using a static dust mop. Secondly, we need damp mopping the laminate flooring. Get away from the traditional wet mop or sponge mop on that laminate floor because too much moisture may cause the flooring to warp, causing long term damage. Instead, use a clean microfiber dry mop head, or buy a kit that includes a laminate floor cleaning solution, along with the mop and mop head. Use a dedicated laminate floor cleaning liquid, or a mixture containing equal amounts of hot water and vinegar in a spray bottle. 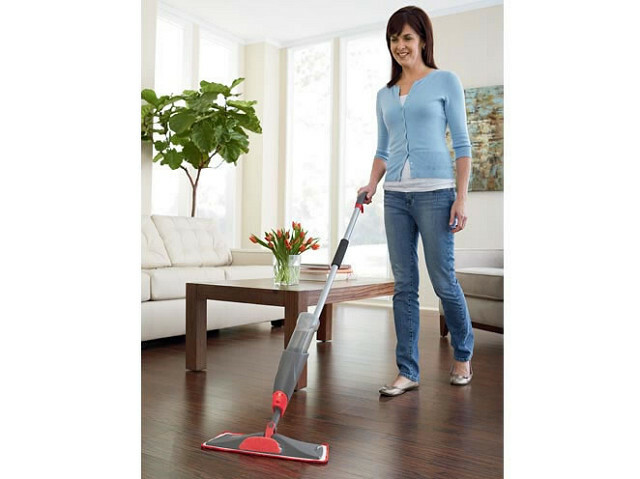 Steam-based floor cleaners or mops that squirt cleaning solution onto the floor should be avoided as well. 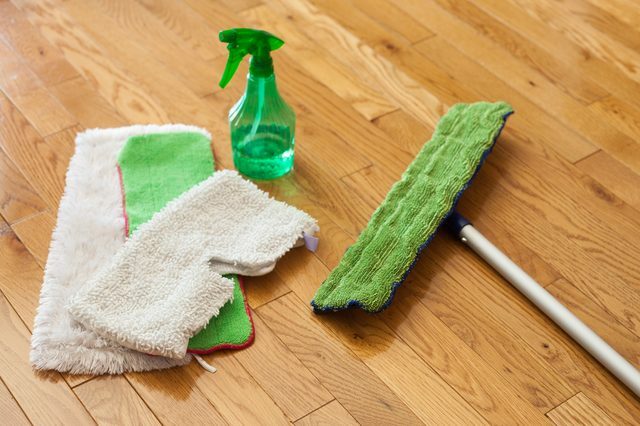 Considering that laminate flooring requires to keep as dry as possible, apply the laminate cleaner or homemade cleaning solution onto the clean microfiber mop head, rather than on the floor itself. Clean the whole floor with the damp mop after dry mopping it with a different mop head. Don’t skip the dry-mopping session; otherwise, you’ll just move the dust and debris around with the damp mop head. Mop the whole floor, checking the mop head frequently for dirt. Once it looks dirty, replace it with a fresh mop head, rather than rinsing the old one out in a bucket. Apply cleaner to the fresh mop head and continue mopping until the whole floor is nice and clean. Do not over spray to make the mop head damp and wet then leaves water on the floor cause damage of laminate flooring.